RandomPottins: Dirty Tricks department turned on Sturgeon: Was Memo Leaked or Faked? Dirty Tricks department turned on Sturgeon: Was Memo Leaked or Faked? STORY TAKEN UP BY MAIL TOO. 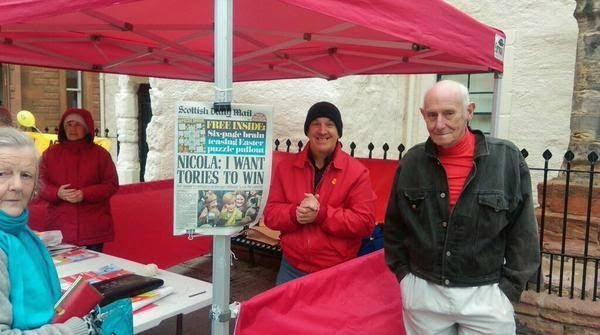 And these Labour campaigners in East Lothian accepted it. (photo by Edddie Truman). Maybe they should remember an earlier story (see below). Or that only last week the Tory Mail called SNP leader "Most Dangerous Woman in Britain". SCOTTISH National Party leader Nicola Sturgeon remained centre stage this weekend, offering Labour's Ed Miliband a deal to keep Tory David Cameron out of Downing Street. Writing in the Observer, Sturgeon challenged Miliband to lead the Labour Party into an anti-austerity alliance with the SNP so they could prevent the Tories forming a government. Miliband has so far ruled out any talk of an alliance before the election. One reason might be that it would make it easier for more Labour supporters to consider switching their votes to the SNP, which is already outpolling the Labour Party in Scotland. The SNP leader's call for an alliance came as an inquiry was being ordered into how the Tory Daily Telegraph obtained a Foreign Office memo about a conversation with the French consul general in which Nicola Sturgeon supposedly confessed that she would prefer to see Cameron remain prime minister. The SNP leader said the story was "categorically, 100%, untrue", and called on Cabinet Secretary Sir Jeremy Heywood to order a probe. The French embassy also denied the report. Unfortunately the Labour Party was quick to accept the Telegraph story and comment about it, without checking what Nicola Sturgeon or the SNP had to say. And if they did not take her word for denial they could have asked why the French ambassador, who is not a party to the election, should feel obliged to cover up. BBC Scotland’s James Cook asked Nicola Sturgeon about the Telegraph‘s "leaked memo", claiming it chimed with what he has been told by senior SNP figures – that it suited their wider purpose to have a Tory Prime Minister because that would rally support for independence. Later Cook complained of the angry way SNP supporters had rounded on him. "What an extraordinary level of vicious abuse I have received today for simply reporting the news. Is this the country we want folks? Is it?" And reporting this the Spectator said it showed the ugly side of Scottish nationalism. The Spectator, whose former editors include Boris Johnson, is owned by the Telegraph group. As for James Cook, he wasn't "simply reporting the news" but repeating a dubious story in the Telegraph and adding his own commentary. It was Nicola Sturgeon who was being hounded. It may be just a coincidence that the Torygraf ran its story - based on a memo supposedly written a month ago, on March 6, concerning a conversation which allegedly took place in February - on Friday, April 3, the day after it was reported that the SNP leader made such an impression in the televised party leaders' debate that viewers in England were saying they wished they could vote for her. A debate in which Sturgeon said she agreed with Ed Miliband on many issues and would be willing to work with him. Craig Murray, an SNP member who also happens to be a former British ambassaddor with more than twenty years' experience in the Foreign and Commonwealth Office, had no doubt about the likely provenance of the "leaked memo" story. "The fake FCO memo has MI5 written all over it. This is the worst example of British security services influencing an election campaign since the Zinoviev letter." 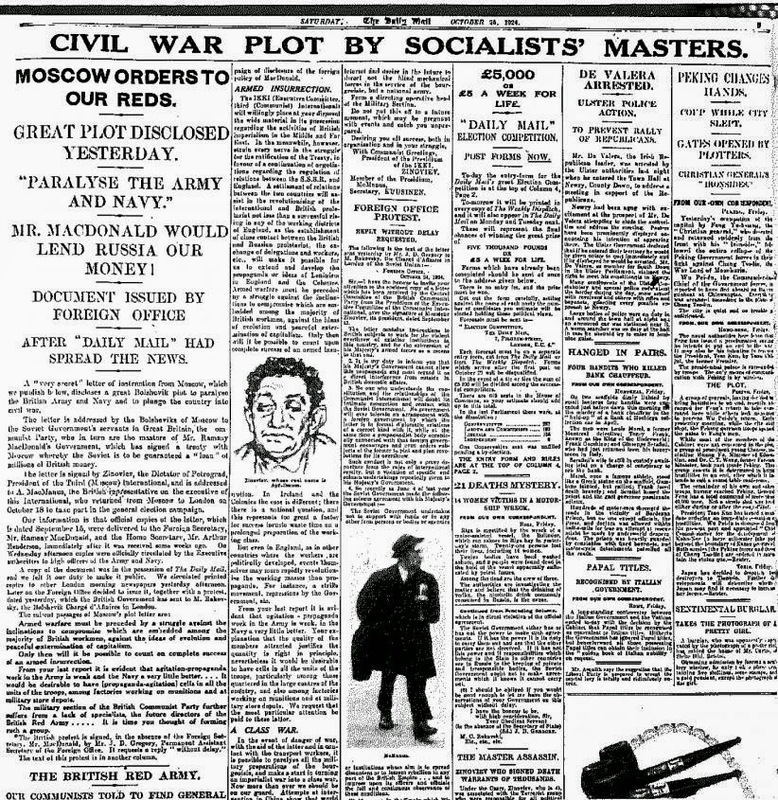 That was of course the alleged letter from the Soviet minister instructing British Communists on subversion, probably forged by Czarist emigres, and presented by an MI5 officer to the Tory Daily Mail, which turned it into a front-page story in time for the 1924 general election, claiming it showed Labour's instructions from the "masters" in the Kremlin. A report commissioned by Robin Cook when he was at the Foreign and Commonwealth confirmed that this was contrived by the security services. Foreign and Commonwealth Office employees are supposed to be "non-political", or so I was told when I once somehow came in sight of a job as filing clerk and tea boy. Maybe passing material to Tory papers does not count as politics; but now I see the FCO says the memo did not come from them, and the Telegraph says its came from the Scottish Office. Craig Murray seems to think it was not so much "leaked", as faked. Whatever we think of the Scottish National Party -and I'm one of those who used to jeer that they were "Tartan Tories" - its leaders are neither knaves nor fools. They know that the votes for independence in the referendum were strongest in what had been solid Labour areas; and that the support they have gained is not based on romantic nationalism nor blaming "the English" but on the wish to defend what's left of the welfare state and build a better Scotland, in opposition to the austerity and privilege that David Cameron represents. The idea that it would be better to have a Tory government make things worse so as to drive people to revolt is a schoolboyish conspiracy notion, of tactics that might work for underground groups desperate to generate resistance in occupied countries, and hoping for outside help. It is no use at all to a party dependent on grass-roots enthusiasm and public trust, and leaders able to articulate their supporters' aspirations with conviction. It is the kind of ulterior motive which those who don't understand mass politics - spies or journalists - sometimes maliciously attribute to the Left, and we will doubtless hear it again if any of the Left groups standing against Labour make a real dent on Labour majorities in the coming election. Maybe some Scottish Labour Party MPs and hangers on, with redundancy staring them in the face, will have clutched gratefully at the Telegraph story, hoping it was true. And some of them might prefer a Tory government rather than have the SNP shoring up Labour, and leaving them sidelined. The Tories - who might be prepared to share government with UKIP if needs be - are bound to want to block and divide any possible combination against them. Besides the SNP's policies on health and education, one aspect of Nicola Sturgeon's appeal beyond Scotland, to voters and many within the Labour Party and further Left, is her forthright opposition to Trident and to nuclear bases in Scotland. And that suggests one reason why the security and intelligence services, and maybe not just in Britain, could have a hidden hand in the campaign against Nicola Sturgeon.